Free Facials for a Year!? All November long, SLOCO Massage & Wellness Spa invites you to drop by and take part in the celebration of the spa’s one year anniversary. Natasha Noel Prybyla, the spa’s Founder, started the organization back in 2010. Her private practice steadily grew into a team of massage therapists and eventually morphed into what it is today—San Luis Obispo’s highly rated, eco-friendly wellness spa, which is celebrating one year in business. The month-long celebration spotlights one of SLOCO’s core values —— wellness education —— by offering complimentary consultations by appointment and tours of the eco-features of their spa. Community members are encouraged to drop by during business hours and see what the spa is all about! Their Healthy Habits Marketplace is a fantastic place to find healthy holiday gift ideas, too. As part of the celebration, SLOCO Massage & Wellness Spa is also launching a new line of mini-treatments on their spa menu for those who need a short, yet sweet, escape from everyday life. Massages and facials can be a bit of a financial and time commitment for some, so these treatments offer a quick and affordable way to treat yourself or someone special. In less than 30 minutes guests get to enjoy the full “spa experience” in half the time, and walk out refreshed and relaxed. These mini-treatments are the perfect last minute service for those with special events, or for the professionals that can’t clear a long block of time from their schedule. The featured giveaway in itself is something worth celebrating! 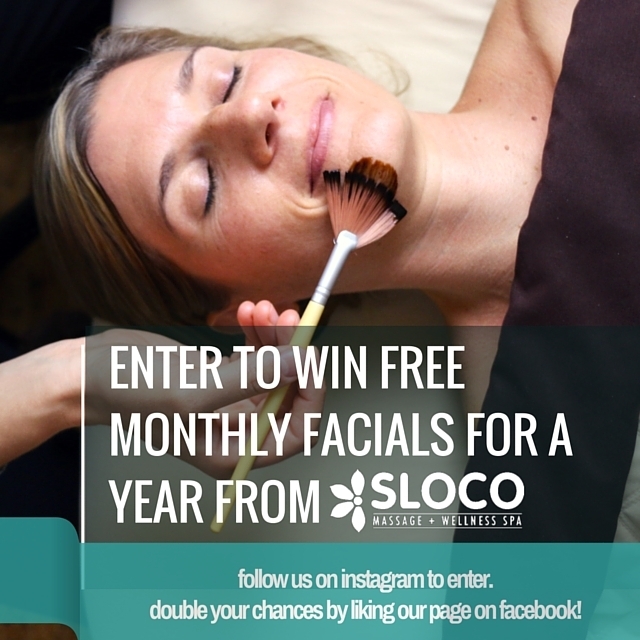 SLOCO Massage & Wellness Spa will choose one lucky winner to receive free monthly facials for one year! A winner will be chosen among a pool of Facebook Fans, Instagram Followers as well as sp guests who enter the drawing in person. Come see for yourself why SLOCO Massage & Wellness Spa is the place to go for a unique spa experience!